Sealed linear encoders from HEIDENHAIN are protected from dust, chips and splash fluids and are ideal for operation on machine tools. 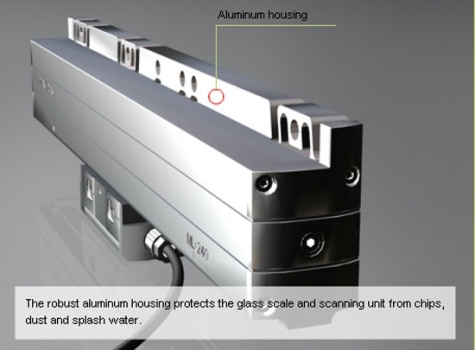 An aluminum housing and elastic sealing lips protect the glass scale, scanning carriage and guideway from chips, swarf, dirt and splashwater The Glass scale's scanning carriage travels in a low-friction guide within the scale unit. It is connected to the external mounting block by a coupling that compensates unavoidable misalignment between the scale and the machine guideways. literature. It offers some great insight into how a linear scale works.